Keelcrab Sail-ONE is an underwater drone made entirely in Italy in order to carry out automated cleaning and hull inspection activities. Designed mainly for cleaning the hull of sailing boats (of any size), yachts and maxi yachts, with a particularly pleasing result at the waterline and on the planing parts as an instrument to optimise hull maintenance. The drone is characterized by an exoskeleton in plastic material with neutral hydrostatic balance. The vacuum / aspiration force is generated by a central impeller or turbine (propeller), driven by an electric motor, which performs the dual function of keeping the drone attached to the hull and removing algae formed thereunder. The movement is driven by rubber brushes on tracks that allow movements in all directions. To improve efficiency removal of vegetation, brushes with nylon bristles have been installed and these can be of various length and diameter. 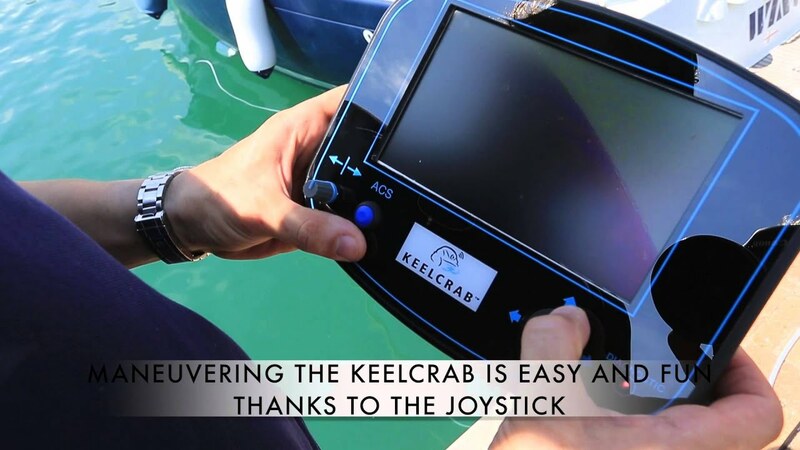 The high-resolution underwater camera IP68 allows Keelcrab Sail-ONE to be maneuvered by means of a wired remote control with display of streaming video on a 7-inch high-resolution screen. Keelcrab Sail-ONE was founded on the concept of “maintaining the hull cleanliness”; brushes are certified of being unable to remove antifouling paints stretched on the hulls. Numerous tests with excellent results, have shown that the constant removal of the first layer of algae (3 mm) dramatically prolongs the efficiency of the anti-fouling agent; this means that barnacles cannot form in the medium term, also in boats stop in port waters from more than 8/10 months. The drone is also provided with a bag (optional on request) for the recovery of the waste material, algae or vegetation, resulting from cleaning operation. Highly functional system wiring (on yachts and maxi yachts) and the connection with their on-board systems: optional unique. We have also available to complete and enhance the Keelcrab SailOne 2017, different optionals (possible to puchase also in the after market contacting us) here below visible clicking on the link. You can contact at info@keelcrab.com to order any of them. ACCESSORIES LIST – TAKE A LOOK!